Ocon is the 2014 FIA F3 champion. © FIA F3 Media. 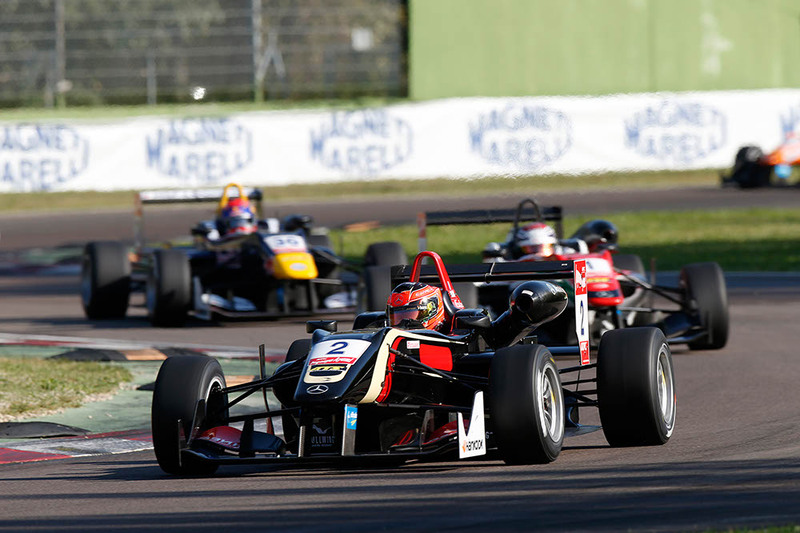 Max Verstappen won the final FIA European F3 race of the weekend at Imola today, but Esteban Ocon’s 3rd place was enough to secure the championship title. Verstappen started from pole, but a sluggish getaway after nearly stalling on the grid allowed Prema Powerteam’s Antonio Fuoco to slip into the lead, while Ocon fell to 3rd having started on the outside of the front row. Thereafter it became a race stuttered by safety car periods, as the Alfa Romeo 4C was needed on three separate occasions. Fuoco bravely held the lead following two restarts, but there was little he could do to stay ahead of the feisty Verstappen when the race went green on lap nine, with the Dutch racer pushing Fuoco to the limits and passing on the approach to Tamburello. Verstappen led with ease for two laps, until the race was neutralised for a final time on lap eleven when Felix Rosenqvist locked wheels with Jordan King, pitching the Swede hard and backwards into an exposed section of wall at Tamburello. Rosenqvist was fine, but it would take a further three laps before the race could restart, at which point Verstappen pulled away from the chasing Fuoco, to win by 2.1s in front of the Fuoco’s band of travelling supporters. Ocon held his nerve to maintain a gap over Nicholas Latifi and Tom Blomqvist – a result that puts him too far ahead of Verstappen and Blomqvist to be caught. Verstappen’s victory puts him back into 2nd in the standings ahead of Blomqvist and into a fight that will be settled next week at Hockenheim. Latifi jumped from 6th to 4th at the start and maintained that position from there, while Blomqvist could do no better than 5th, although the Carlin racer did spend some time fending off Will Buller after the final green flag. Buller had a time defending against Jake Dennis and briefly lost the position on lap 11 when Dennis tried for a move into Villeneuve; however Buller forced his Signature machine back ahead. Dennis would keep 7th, but only just ahead of Lucas Auer, with the Austrian attacking the Englishman having already passed Felix Serralles on the third lap. Serralles continued onward to 9th place, with Gustavo Menezes just one second adrift. The American Menezes fought a brave race – having started 17th, the van Amersfoort man took five places off the line, before sweeping by Roy Nissany (lap 3) and King (lap 15). Menezes did have a brief battle and position swap with Rosenqvist at the halfway point in the race, prior to the Swede clashing with King. The two other safety car periods came early on. As the field ran through the exit on Tamburello and on the way to Villeneuve on the opening lap, Ed Jones and King touched, which pitched the latter into Antonio Giovinazzi, shredding Giovinazzi’s right rear tyre and stranding him on the circuit. The second safety car was called on lap five Sandro Zeller suffered a high speed spin on the entry into Tamburello which briefly pitched his Zeller Racing machine airbourne. A lap later Tatiana Calderon retired with a broken right front suspension arm.